One of the first sports to be included in the Paralympic program, Wheelchair Fencing made its debut in England in 1953 in the Stoke Mandeville Games, a competition especially for war veterans. The first countries to develop the sport were precisely those with a tradition in world fencing: England, France and Italy. When it was introduced in the 1960 Paralympic Games in Rome, the program proposed included only saber events. Based on the regulations of the International Fencing Federation (FIE, in French), two more weapons were introduced—foil and epée—in the Tokyo Games four years later. 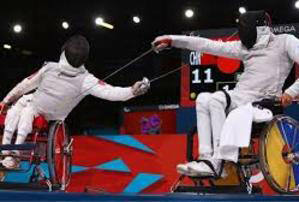 Only people with locomotor disabilities may compete in Wheelchair Fencing; the most common are amputations, paraplegia, congenital malformations and strokes. Categories are divided according to each athlete's balance in the wheelchair, and the condition of the arm which will wield the weapon. The difference compared to Olympic fencing is that the athletes' chairs are anchored to the ground by fixing devices, which limit the game space and allow athletes to fence without moving the chair. 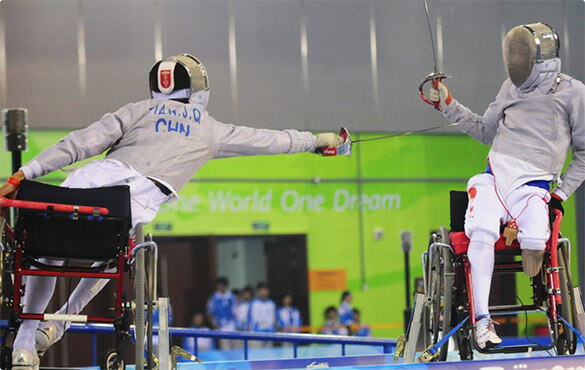 If one of the fencers moves his chair, the combat is stopped. The equipment required for the sport includes a mask, jacket and protective gloves. 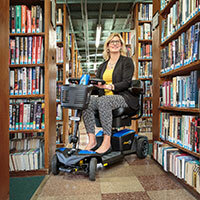 In a foil match, there is a protective shield for the chair's wheels. In epée disputes, a metal apron is used to protect the competitor's legs and the wheels of the chair. The competition area is 4 meters long by 1.5 m wide. Using special sensors, the fencers are connected to an electronic counting system, which indicates whether a touch is valid and, based on this, the referee decides whether or not it earns a point, and for which athlete in the case of a double touch. Each of the weapons used has its own scoring area: the foil is limited to the trunk, not including the arms and head, while in epée touches are valid from the waist up, including the arms and mask. With the saber, touches are allowed with any part of the blade (tip and edges) and the valid target is the entire surface area from the waistline up, including arms and mask. The southeast United States has a large and competitive fencing community and has seen extremely rapid growth in the past 10 years, with numerous clubs operating in most any metropolitan city. High-level fencing competitions can be found on any given weekend within three to five hours drive from Atlanta, but rarely do these events include wheelchair fencing. 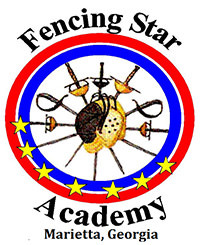 The goal of Fencing Star Academy, currently operating in Marietta, Georgia, is to create an Atlanta-based center that not only trains athletes, but also holds competitions for wheelchair fencing from youth to Olympic-level fencers. Atlanta's community of people with disabilities is ripe for the exciting sport of wheelchair fencing! Not only have the academy's organizers worked with Paralympic Head Coach Maestro Les Stawicki, two of the Paralympic assistant coaches and current team member reside locally and are eager to groom the next generation of wheelchair fencers. While most of the competitive U.S. wheelchair fencers are veteran age fencers, who either started later in life or had a background in fencing, the Fencing Star Academy is passionately committed to expanding the reach of this vibrant sport. They have picked Atlanta to create the first youth-oriented fencing program in the United States specifically for the development of world class fencers. Wheelchair fencers would train right along with other youth and club members and compete nationally. If you are in the Atlanta area, come to Abilities Expo on March 14-16 and try your hand at fencing. As you and your friends learn to thrust and parry, we hope to garner enough local interest and support to allow Fencing Star Academy to bring wheelchair fencing to Atlanta permanently. We look forward to the opportunity to train the area's athletes with disabilities to master wheelchair fencing!